Can you grow a hot chilli? We all know different varieties of chillies vary considerably in heat level. However, it is not just down to genetics, the environment a chilli plant is grown in also has a major influence on heat level. This means that very chilli grower - whether they have just a single plant in on their kitchen windowsill or hundreds in a poly tunnel – could be producing chillies that have a record-breaking heat level. Have you ever wondered if you are? Now is the chance to find out. The challenge is to see who can grow the HOTTEST CHILLI. So take up the challenge and get yours tested. This site was set up as a co-operative concept by Sea Spring Seeds and Simpson’s Seeds. 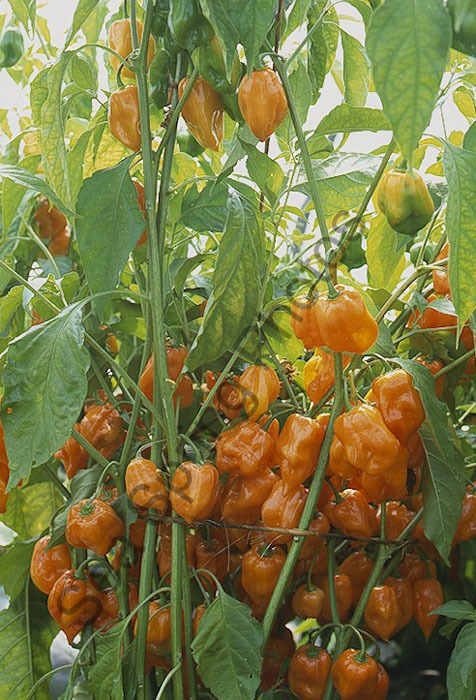 The aim is to see who grows Britain's Hottest Chilli. Using an dependent, and highly credible laboratory, the National Mineral Analysis Lab at Warwick University to provide an unbiased and totally objective result. Thus settling any arguments. The competition is going to be run on an annual basis, as different years will have differing climates, which have a major effect on the heat levels. It may also settle an argument, as to whether chillies are hotter grown in the hotter and drier southern counties, or the milder northern counties that receive longer day lengths.